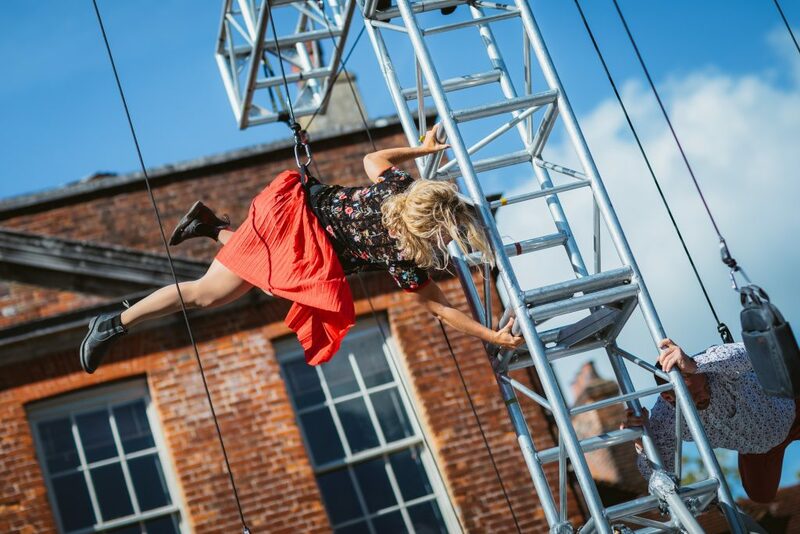 To me, To you… is the new, playful small-scale aerial dance show by the critically acclaimed company, Wired Aerial Theatre. This show is all about finding balance – a grapple with the push and pull that resides in all of us. This very regular couple bounce and swirl about the stage, playing with the stresses and strains of life in a lively investigation of how we find balance ourselves and with those around us. Performed on the ground and in the air, where delicate and expressive movements guide the audience through the twists and turns and highs and lows of the modern age, Wired invite you in, to share just another day in the life of this quite ordinary pair. Wired is an acclaimed aerial company and pioneers in the use of bungee in contemporary dance. Wired delivers higher education training in aerial technique in performance, and Wired’s masterclasses in bungee-assisted dance, aerial and harness techniques and vertical wall work attract participants from around the world. Commissioned by Without Walls and Brighton Festival.